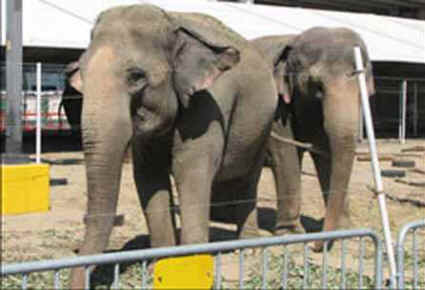 A six-week-long trial against Ringling Bros. and Barnum & Bailey circus on charges that it mistreats its Asian elephants in violation of the Endangered Species Act (ESA) concluded March 18, 2009. The lawsuit alleged that the use of the bullhook and the constant chaining of elephants wounds, harasses and harms the animals. The Judge has not yet rendered a decision in this precedent-setting case but the verdict is forthcoming. No matter the outcome, it is now undeniable that these magnificent animals suffer greatly in the name of entertainment. I was present at the bulk of the trial and served as a witness in our case. Each day brought the introduction of countless pieces of evidence, as well as witnesses, all demonstrating that Ringling’s practice of bullhook use and near constant chaining of elephants is pervasive, routine and a violation of the ESA. Volumes of evidence revealed how long the animals are kept immobilized in chains; video footage showed employees hitting elephants with bullhooks; correspondence and government enforcement records discussed animal welfare concerns; and Ringling’s own medical records described the poor health conditions of the elephants. • All of Ringling’s adult elephants suffer from foot-related problems—lameness, nail cracks and toe abscesses—and many have arthritis as a result of being restrained by chains and standing on hard surfaces for most of their lives. • 14 of Ringling’s 16 baby elephants suffer from similar foot and joint problems, again as a result of being restrained by chains on hard surfaces. • Ringling’s transportation records proved that elephants spend extensive amounts of time being chained. These records documented elephants being chained for up to 100 consecutive hours in cramped circus railroad cars. • Countless hours of video footage were entered into evidence showing the elephants being routinely hooked and chained. • Deposition transcripts of former Ringling employees were entered into evidence which state that while employed for Ringling they saw handlers routinely hit elephants with bullhooks. • Ringling veterinary assistant reported that “[a]fter this morning’s baths, at least four of the elephants came in with multiple abrasions and lacerations from the hooks.” “The lacerations were very visible… [a handler] applied wonder dust just before the show.” Wonder dust is used to stop the bleeding of a wound and it is charcoal in color which covers up the spot from public view. Shocking statements were made by witnesses in the case further proving the treatment that these animals endure. Kenneth Feld, CEO of Feld Entertainment, Ringling’s parent company, admitted under oath on cross examination that all of his handlers strike the elephants with bullhooks. This comes after years of denying this very fact—a fact that we knew all along. Also, the manager of the Center for Elephant Conservation (CEC), Ringling’s breeding facility in Florida, a facility which Ringling boasts is “the ideal environment” in which Asian elephants “flourish and thrive,” testified that the elephants at the CEC spend, on average, 16 hours chained while some spend more than 22 hours chained on concrete. Americans are focused on making changes in their daily lives to help save our planet—from eating less (or, even better, no) meat, to driving less, using alternate energy sources and more. We have made it illegal to abuse our companion animals with a bevy of laws protecting dogs and cats. Since wildlife, and endangered species in particular, are so vital to our environmental success, shouldn’t not buying a ticket to an antiquated show, that evidence reveals mistreats endangered animals, be an easy decision to make? We must take a strong stand against this type of mistreatment and not support circuses that use animals. Nicole G. Paquette, Esq., is senior vice president and general counsel for Born Free USA (formerly Animal Protection Institute). Born Free USA along with co-plaintiffs, American Society for the Prevention of Cruelty to Animals, Animal Welfare Institute, The Fund for Animals, and former Ringling employee Tom Rider were represented by the public interest law firm of Meyer, Glitzenstein, and Crystal.